The Achilles tendon connects the muscles at the back of the calf (the gastrocnemius and the soleus) to the heel bone. As the largest tendon in the human body, it enables you to perform many everyday activities including walking, running and jumping. While it is very strong, it is susceptible to tendonitis when overused. Achilles tendonitis, also referred to as Achilles tendinitis, occurs due to overuse or degeneration of the Achilles tendon. 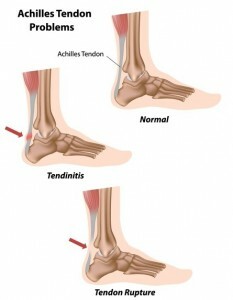 The pain associated with Achilles tendonitis is caused by inflammation. Most cases of Achilles tendonitis result from sports-related activities, specifically those involving jumping, running or sudden starts and stops. Unlike Achilles tendon ruptures, tendonitis isn’t caused by a one-time injury. Rather, it occurs gradually over time due to repeated stress on the tendon. Athletes who quickly increase activity level, such as the distance or duration of runs, without giving the body time to adjust are more prone to this injury. In addition, middle-aged individuals who participate in the same activity on an occasional basis, such as playing tennis on weekends, can be susceptible to the injury over time. What are the types of Achilles tendonitis? Noninsertional Achilles tendonitis occurs in the middle of the tendon above the heel. Insertional Achilles tendonitis occurs at the bottom portion of the tendon where the tendon actually “inserts” or attaches to the heel bone. It is also possible that you will be able to see a physical thickening or hardening of the tendon from a side view. This often appears as a raised bump. With insertional tendonitis, affecting the area where the Achilles attaches to the heel bone, bone spurs (extra bone growths) are another potential symptom. In the event that you experience a sudden popping or snapping sensation in your lower leg followed by sharp pain, there is a good chance you may have ruptured or torn your Achilles tendon and you should seek medical evaluation immediately. What are the risk factors for Achilles tendonitis? What are the treatment options for Achilles tendonitis? If you are experiencing pain, swelling or tenderness along the back of the lower leg, call our office at 212‑434‑4920 or fill out the schedule appointment form on this page so Stuart Katchis, M.D. can treat your injury as soon as possible. Achilles tendonitis is fully treatable without surgery for most patients. Even in severe cases, conservative treatment options will be recommended first to gauge their effectiveness prior to considering surgical options. The first and most important step to recovery is stopping or reducing all activities that make the pain worse, particularly those high-impact activities that place considerable strain on the inflamed tendon. Inserts placed in the shoes that elevate the heel can sometimes improve pain and assist the recovery process by taking pressure and strain off the injured tendon. Compression wraps or bandages can stabilize the injured tendon by reducing its movement. In addition, they may help reduce swelling. Typically performed when a patient has difficulty flexing the foot despite regular stretching, this procedure lengthens one of the two gastrocnemius muscles in the calf to help relieve chronic Achilles tendonitis caused by tight calf muscles. The surgery involves Dr. Katchis making a small incision in the back of the leg through which he can view the muscle, either directly or via an endoscope, and then perform a release on the tendon. The muscle is then left to heal on its own or sutured to the underlying tissue in its new position. Typically performed in cases where there is significant damage to the Achilles tendon, a debridement procedure involves the orthopedic surgeon resecting, or removing, the damaged portion of the tendon and then repairing the remaining tendon. In severe cases, the repair may involve transferring other tissue to reinforce it, called an Achilles tendon transfer. With insertional tendonitis, surgery is often required to remove bone spurs as part of the Achilles tendon repair. In these cases, anchors may need to be inserted by the heel to secure the Achilles tendon in place. Recovery times will vary depending on the severity of each patient’s condition. Whether you undergo nonsurgical or surgical treatment for Achilles tendonitis, physical therapy is often an essential part of the recovery process. Physical therapy will help rebuild the strength of the injured tendon and the surrounding leg muscles. It is important to note that a weakened Achilles tendon is more susceptible to tearing so proper healing is especially important.